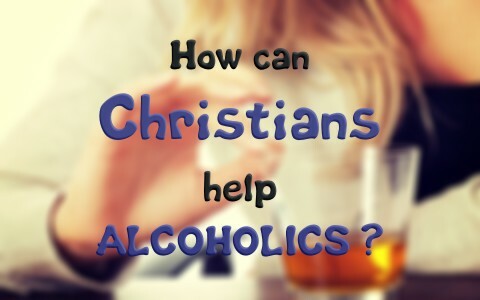 What can you, a believer, do to help someone struggling with alcohol? What’s the Christian’s approach in such cases? When Jesus came to die for sinners, He didn’t wait until we “cleaned up” our lives. He saved us even while we were ungodly, wicked sinners who were God’s enemies (Rom 5:6-10), so who dies for an enemy? God does, in Jesus Christ. So many people I speak with cannot get over their own sins and they keep tripping over what’s behind them, so I ask them, “How many of your sins were ahead of you at the cross?” Obviously, all of them. We hadn’t even been born when Jesus died for our sins, so for those who have been brought to repentance and faith in Christ, they must recognize that God’s love and forgiveness is unconditional once they’ve trusted in Christ. It’s not a matter of performance, but a matter of what Christ has done at Calvary. If we recognize that our sins are great, God’s grace is greater still, so if we abandon our brother and sister in their time of need, such as during their battle with alcoholism, we are not really their friend, and we are not showing the love of God. God loves us but loves us enough to discipline us, so sometimes it takes “tough love” to ensure we stay on track. The Bible says “For the moment all discipline seems painful rather than pleasant, but later it yields the peaceful fruit of righteousness to those who have been trained by it” (Heb 12:11). When we see a brother or sister struggling with alcoholism, or any other substance abuse, we must not ignore it. What if it were us that needed help? Of course, it won’t be easy, because the Bible says that even the discipline of the Lord seems painful, but it bears the “fruit of righteousness to those who have been trained by it.” One of the most loving things we can do as believers is to correct a fellow believer, but most people don’t want to get involved because the person can strike back, but it’s not as if we are living the Christian life as a solo act. We need one another, and more so as the day of the Lord’s return nears (Heb 10:24-25), so how do you approach a brother or sister who is battling the stronghold of alcohol? I would say we approach them privately but also very lovingly, and out of a deep concern for their spiritual welfare. If we approach them in a judgmental or condemning way, this might do more harm than good, and they might refuse anyone’s help. When God saved us, He didn’t save us to be by ourselves but to come alongside other believers who are struggling with life issues. Those who suffer from alcoholism may find it difficult to locate support, and someone who has issues with alcohol should never have to deal with the problem alone. Thankfully, there is Alcoholics Anonymous. The idea “Once an alcoholic, always an alcoholic” may be true in the sense of those who have overcome this scourge may still be susceptible to falling again, but it’s not true that they cannot overcome. Jesus said He overcame the world (John 16:33), so it is possible for us and them to be overcomers, however, it’s never done in isolation. If someone stops attending our church, I check on them to see if they’re okay, but I don’t say, “Hey, where have you been?” Instead, I ask, “How are you? We missed you…are you doing okay?” The one thing they don’t need is guilt on top of guilt. If we don’t reach out to help them, who will? Remember, what we do to the least of the brothers and sisters, we do for Christ (Matt 25:40), so like Samuel, we can say, or at least should say, “Moreover, as for me, far be it from me that I should sin against the LORD by ceasing to pray for you, and I will instruct you in the good and the right way” (1st Sam 12:23). Again, if we turn the tables, would you not want someone praying for you if you were in their situation? Would you want others to condemn you and make you feel even more hopeless? Some of the greatest people in the world accomplished great things in their life after overcoming alcoholism. For believers, we have hope, and we have the hope that we can do all things through Jesus Christ Who will strengthen us (Phil 4:13), and by the Apostle Paul saying, “all things,” this certainly includes alcoholism. Jesus also said we can do nothing without Him (John 15:5), and nothing is not a little something…it is nothing. I love what Alcoholics Anonymous stands for, and even though it’s not strictly a faith-based recovery program, they do acknowledge that we need some outside support and help, so this allows God to enter the picture and gives them the hope of God, the hope of His power through His Spirit, the hope of the prayers of fellow alcoholics, and the prayers of the saints (including ours! ), but after a person recovers, there is still more to do. For example, if we are calling a person a “recovering” addict or alcoholic, this implies that he or she is still actively overcoming the lingering problems of an addictive lifestyle. For some who have overcome this stronghold, there may remain some deep-seated attitudes that keep an addict locked in his addiction. These may include pride, rebellion against authority, dishonesty, manipulation, blame-shifting, resentments, and procrastination, but while these “character defects” are common problems with practically all addicts, continuing to label them as alcoholics may lead to them falling back into it again, making them feel like helpless victims of what is wrongly a “disease.” By the way, we cannot judge AA just because they’ve removed much of the “Christian” language in their 12 Step program because they still encourage people to get spiritual instruction and fellowship from the Church and other organized religious bodies outside of itself, so that is to their credit. The next time you see someone battling with alcoholism or some other addiction, either illegal substances or even prescriptions, remember that they are battling something that they cannot overcome alone. We need to come alongside them as accountability partners and we must include them in our plans to make them feel part of the Christian community. The truth is, we all struggle with our own addictions and lust-based sins. It is by the grace of God that we ourselves are not in their shoes, so it’s up to us to pray for them, encourage them, and help them in any way we can, but without them taking advantage of us. There is a fine line between helping them and stripping all hope away. Take a look at this related article: Where Should a Christian Addicted to Drugs Turn? i feel the pain of discipline and i thank you for this faith based website. it helped me understand what AA stands for, thank you again. Thank you Mr. Elliott. I am glad it could help you sir. I will pray for you right now. Thank you Jack, actually there is a 12 step programme based 100% on biblical teaching. Blessings. Yes….very good suggestion sir. Thank you. Hello my friend, I am so sorry for the pain you must feel. I am praying now for you and your son. God does not give up on us and amother’s love never does either. God bless you ma’am. Next post: How Does the Birth of Christ Give Us Comfort and Joy to Live for Him?